Three fans of the trains at Harmony Park enjoy an evening earlier this summer. American Eagle is the company that designed the official websites for The Village of Arlington Heights (vah.com) and Discover Arlington (DiscoverArlington.com). A map showing all of the trains and their locations can be picked up at Village Hall or any of the great 125th anniversary sponsors. The “train barons” also have brochures available at their offices. Sponsors include: Arlington Park Racetrack, Village Bank & Trust, Lutheran Home, Mariano’s, Javier’s, DKM&O, Visualedge, Glueckert Funeral Home, Daily Herald, Mitchell’s Jewelers, Heller Lumber, Northwest Speech and Heart Center and the Frontier Days Festival. 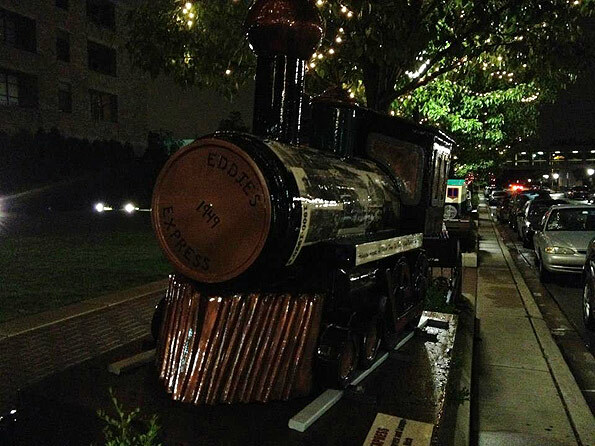 Eddie’s Express train locomotive at Harmony Park. “EAB Express” — Arlington Heights Public Works Dept. “Circus Train Special” — Frontier Days, Inc.